Hardly a place intended to kids, this hellish eternity exists in the Neverworld - a doomed miserable place, where all frightening toys and dolls get sent to (by the benevolent higher powers) and - hopefully - never come out to see the light of day. 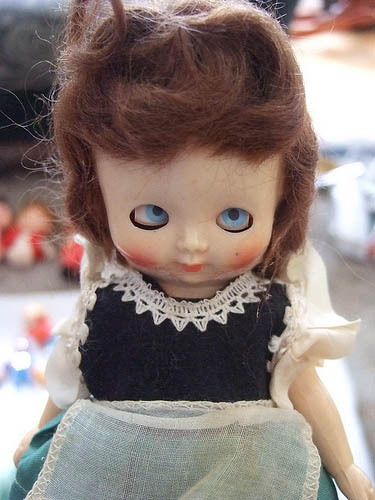 Ever since our "Nightmare Playgrounds" series got popular, we were asked to make a list of the most creepy and scary dolls that kids (and often their parents) get to enjoy and play with. 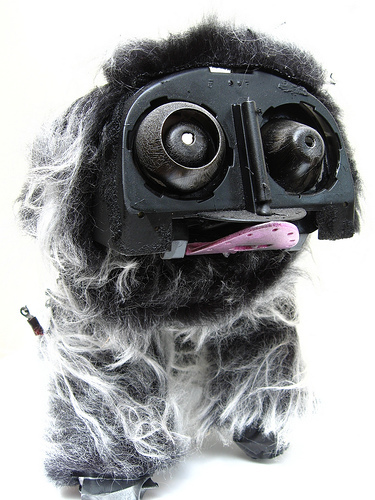 So far you've seen some really frightening mannequins and crazy toys (as part of this page). But now we are going to heat up things a notch and spook you (in time for Halloween) with the ultimate bad and rejected toy creations. Should we start with the scariest? 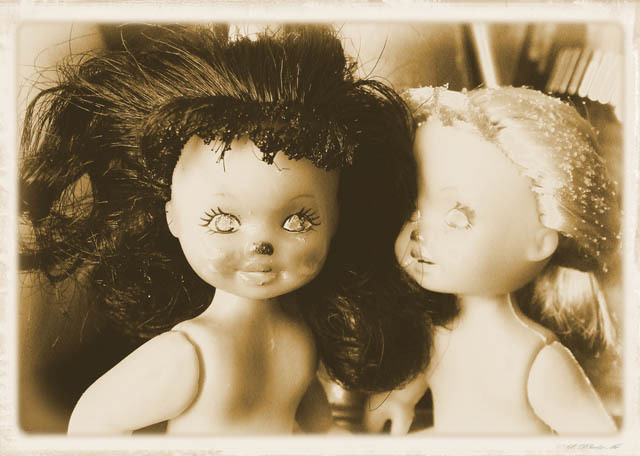 Flickr abounds in photo pools with this subject matter: Unloved Toys, Scary Dolls, The Island of Lost Toys, Strange Toys... Go explore them and come back sane. Every toy manufacturer has its "blond moment" sometime, but most re-compose themselves, fight a few lawsuits if necessary, and get back on track quickly. 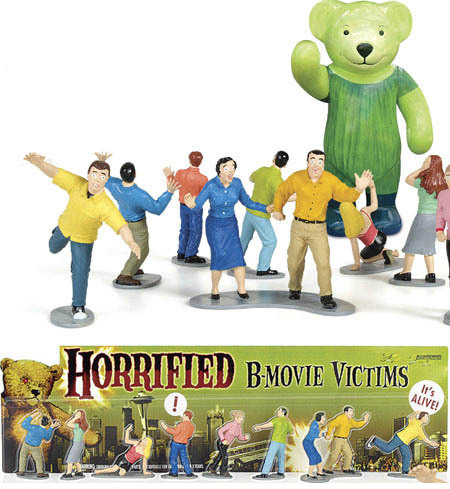 At first I did not see the bear and thought that these guys are actually fleeing from theater after seeing some really atrocious B-movie. One of them almost looks like Roger Ebert. No comment. Order them here and watch them melt. 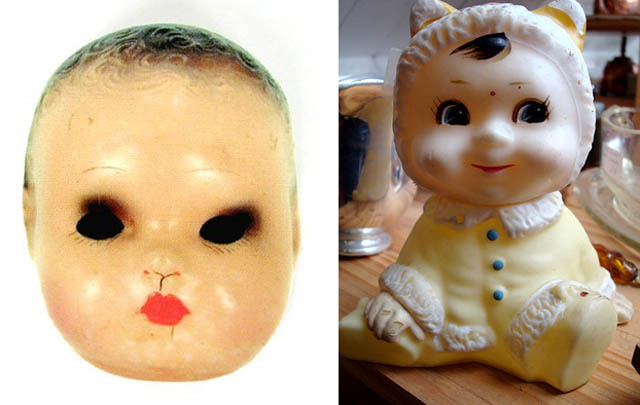 There are also creepy baby lamps you can buy. 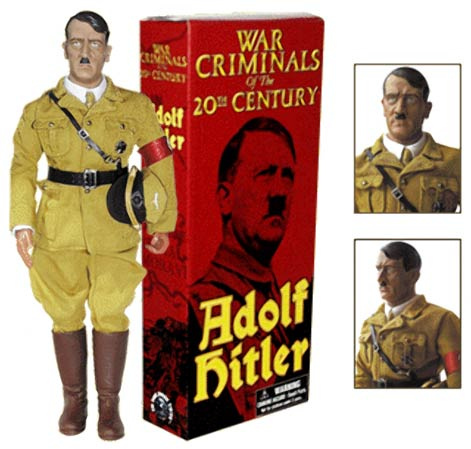 Hitler has been made into a toy statue. There is no toy Stalin yet, to my knowledge. Put this toy on top of your computer monitor and no boss would dare to come to you (without having second thoughts). And yes, it glows in the dark. Funny how the creepiest thing in the world is the laughter that fails to stop. Oh my God! where did you found these pictures. They are really creepy. I like them. 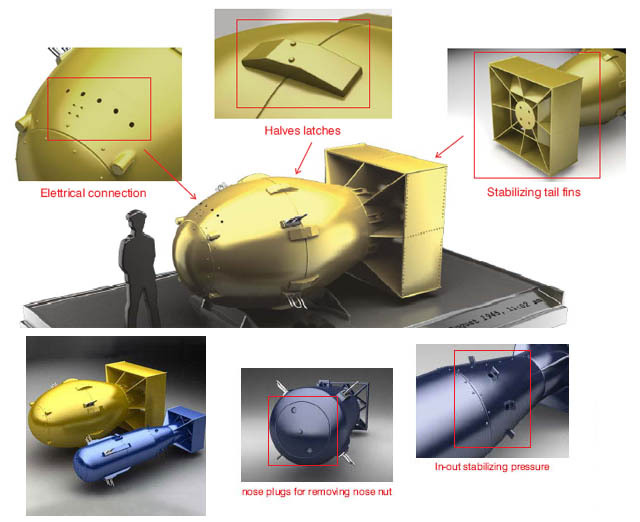 Wow, I like those mini nukes. 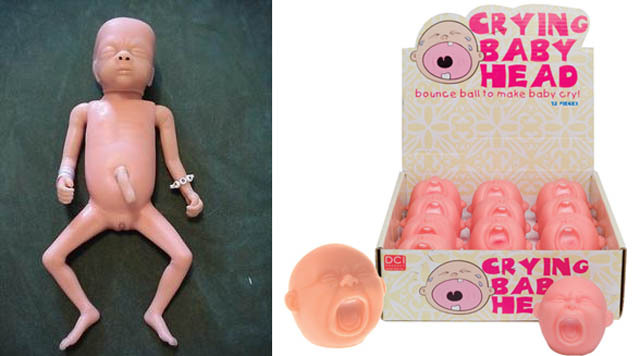 Uncanny valley for that fake baby. 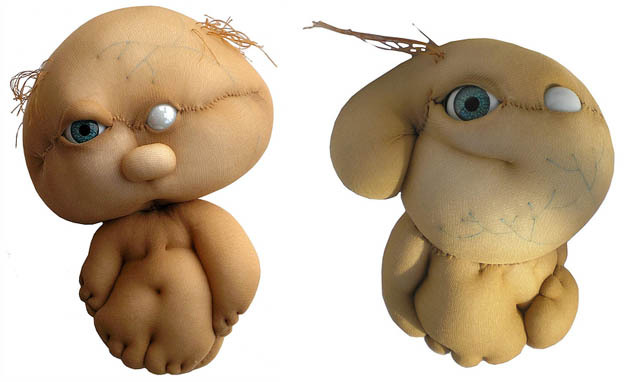 I once walked by a remote abandoned house, and in the bushes, in the rain, was a collection of naked dolls like those first pictures up here, missing eyes, limbs, heads... Creepiest thing I ever saw. Oh lord, that "baby laugh-a-lot" ad is pure evil. Is it for real? 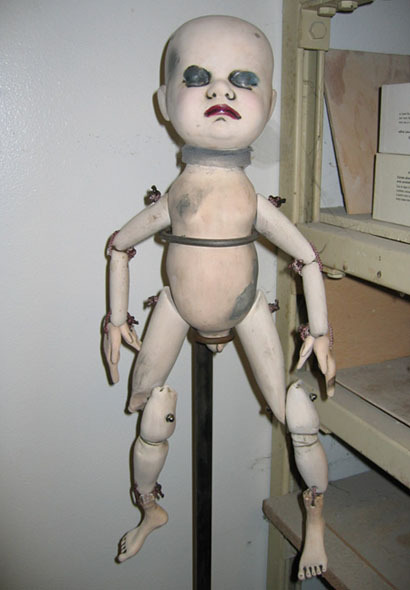 Don't know why, but I've always been creeped out by dolls. I put together a slide show of your pics with some music (hope you don't mind). 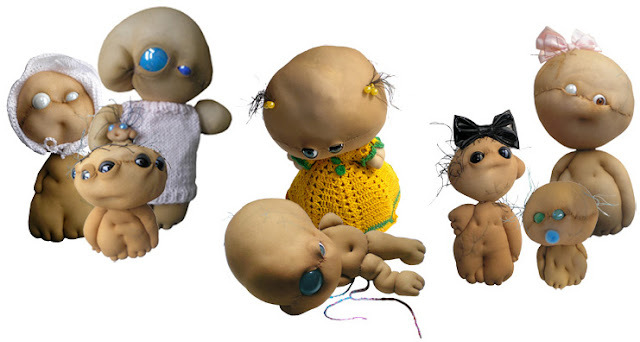 I added a few other creepy dolls I found on the web. 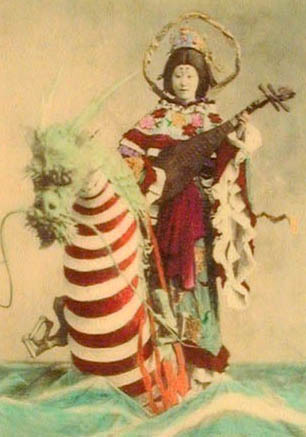 There is a small island in mexico City where the ownwer tried to protect himself from evil ghosts with creepy dolls. My godfather-in-law outfits his Kentucky home with an astounding display of macabre baby doll folk art. That link just gives a glimpse. You can Google the guy for more - but you really have to visit the property to get the full impression. 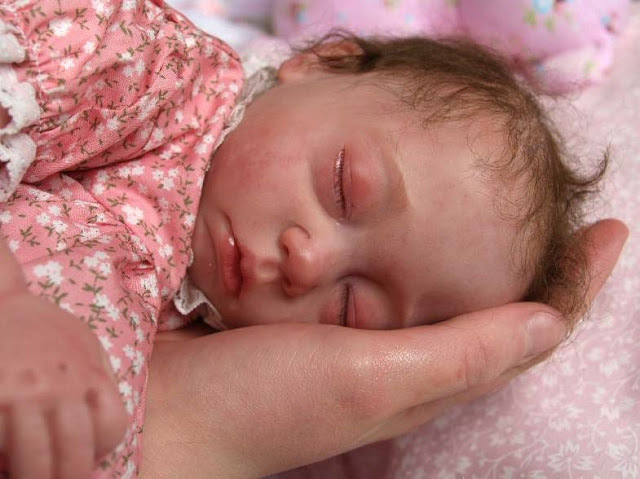 I'm glad you touched upon those realistic "Reborn" dolls -- the whole psychology behind those things is fucked up. Karenw - credit is added, we will feature your work more in Part 2, with more info from these comments. Thank you! Hey, I read with interest the discussion of our beloved art of reborning (the creation of reborn babies, reborn dolls, fake babies or whatever you want to call them!) and just want to point out that the ladies taking part are very normal, gifted and talented individuals. A forum for discussion of this subject without prejudice can be found at Reborn Babies UK, there you will find very nice ladies - friendly, and definitely not wierd. PS. None of us make Hitler dolls! 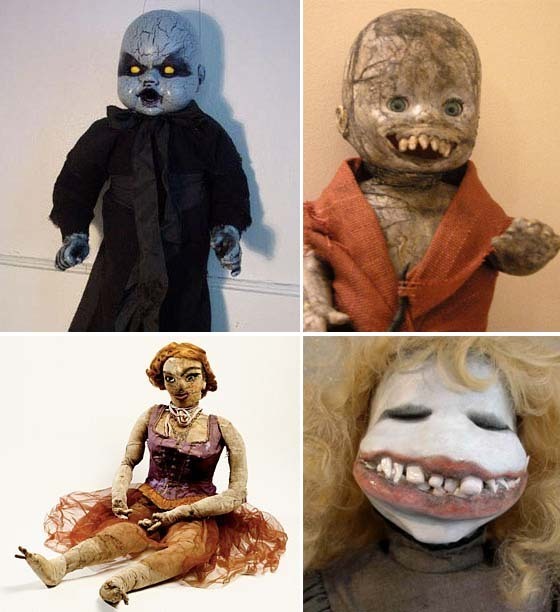 Some of these definitely have a horrific appearance that would haunt childrens' dreams for years to come lol! 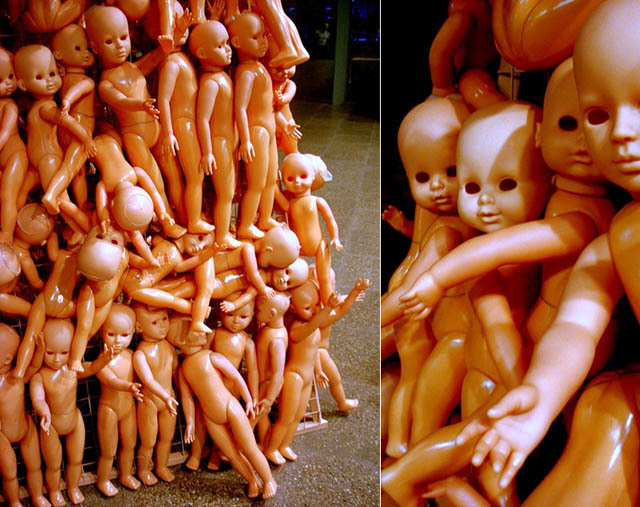 Personally, though, I think some of the zombie and even monkey reborn dolls are the craziest. How can you do a page like this without 'Talky Tina'.